One of my favorite yoga teachers has all of us choose a “Fairy Oracle” card from a deck at the beginning of each class. Each card has a concept or idea on it that we can use to focus on during our practice, if we so choose. At the end of class, you can look up in the little guide-book to see what the meaning behind it is. I don’t know how much I believe in fairies or oracles, but I do enjoy reading the meanings behind these cards and sometimes it leaves me with a message I take to heart. Recently, I pulled the “Happily Ever After” card. The meaning behind it was that no one needs to be concerned with their future because they are already living their own “happily ever after.” By taking joy in your creation and the perfection that nature has brought you to in this very moment, that joy will be your destiny. If you don’t live in this precious moment that is happening right now, but instead choose to worry about your future, that worry will become your destiny. I don’t know about you, but I choose joy. Instead of waiting to “make it” or until we have finally “arrived” or until we have found that someone or something to complete our lives, lets rejoice in the fact that we already have! We are all already living our “happily ever afters”- How great is that?!?! Preheat oven to 275°. Line two baking sheets with parchment paper and lightly spray with vegan non-stick spray. In a large bowl, combine the dry ingredients. In a small bowl, combine the wet ingredients. Heat the wet ingredients in the microwave for about 1 minute and 45 seconds, until hot, but not boiling. Use a whisk to stir until peanut butter is completely combined. Add the wet ingredients to the dry ingredients and mix to combine. Divide the mixture between the two baking sheets, and spread out evenly. Put the baking sheets in the oven, one on the center rack, and one on the lower rack. After 25 minutes, switch the sheets, putting the one from the bottom rack on the center rack, and vice versa. Cook for another 20 minutes, and remove from oven. Let sit until cool. 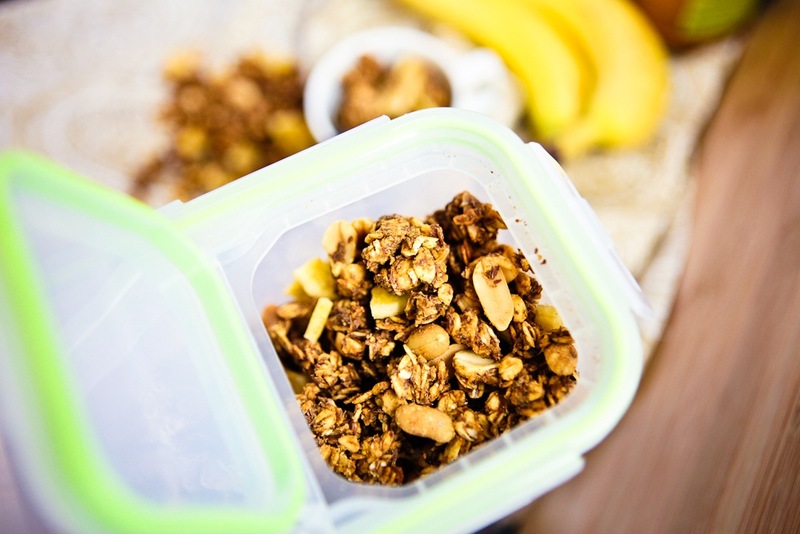 Once cool, gently remove from sheets and put into a glass or Tupperware-type container. How are you rejoicing in living your “happily ever after”? 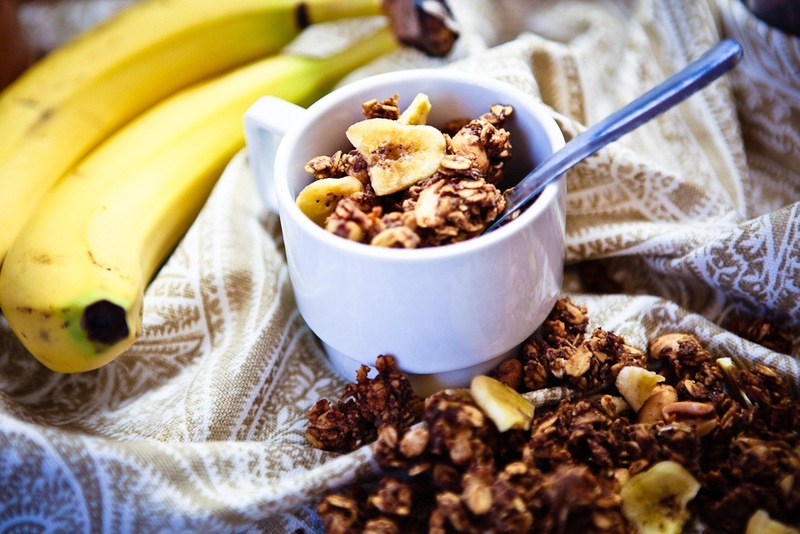 22 Responses to "Peanut Butter Banana Granola"
I was *this* close to adding chocolate chips, but because I’m the type of chic that shovels fistfuls of cereal into her mouth whenever I see it, I knew that I wouldn’t be able to practice any sort of control if there were chocolate chips in it. I’m glad you like it, Somer- let me know how it goes with the chocolate chips! Hehe. Maybe you are right, I have no restraint either! I bought my kids Koala puffs (rice cereal with chocolate) as a special treat. I think I have eaten most of the box. Ridiculous. I totally feel you right now. My stepdaughter loves Barbara’s Peanut Butter Puffins, and you could say I am in Puffins rehab. I seriously OD’d on them, haha! and peanut butter and banana? ’tis no better combination! i love the simplicity of this recipe and that it doesn’t call for a ton of sugar, and the sugar is does call for is agave and apple juice. how clever! It does take a conscious effort to live presently, doesn’t it? It is something I work on constantly. This card was a great reminder- Yay for joy! This is a gorgeous post! Both the words and the recipe. 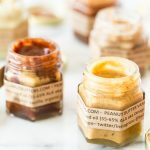 You’re so right- banana and pb is one of the most perfect pairings, not just in the food world, but in the ENTIRE world. I mean it really doesn’t get much better does it? 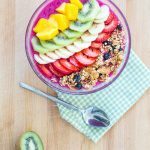 Love the ingredients too- so many healthy fats and low glycemic to boot 🙂 awesome, my friend! Thanks, Gabby! 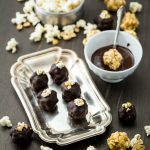 I thought of throwing chocolate chips in the mix, because peanut butter and banana are both good friends with chocolate, but decided to keep it a little healthier (and keep my self-control in check). My favorite flavors! And no added oil…and not tons of sweetener. Beautiful! Kristy, you are such a soothsayer lately! I need to get some post-its and put up reminders to myself about living happily ever after today. It’s an excellent reminder. Or maybe I just need one memo on my mirror that says, “Joy is your destiny.” Amen, sister! I’m so glad the “words of the fairies” spoke to you as much as they did me. 😉 I like the post-it idea, though- I leave notes to myself everywhere, but they’re never reaffirming ones (usually just reminders). I think I need a “Joy is Your Destiny” one on right on the edge of my computer screen! 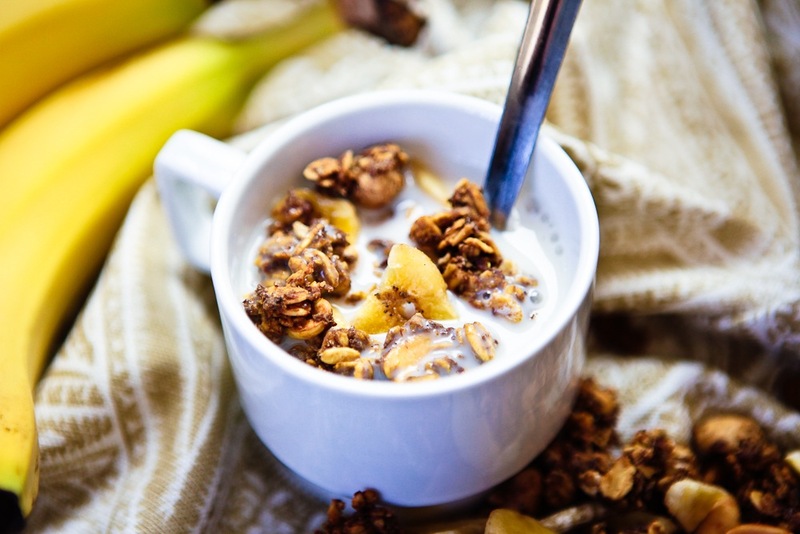 i love the banana chips in the granola. and no oil! this is a keeper. and the words my friend, need to be put on a bunch of post its around my house! Thanks, Richa! I think you and Cadry are onto something- I need more reaffirming post-its and less “to-do list” post-its! 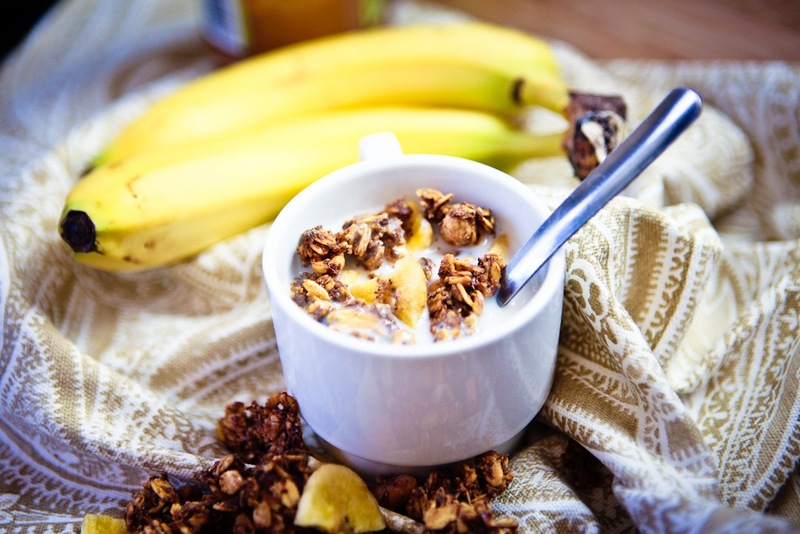 Holy moly…now that’s a granola recipe that I could eat every DAY! Ooooh, Katie, I think you should! 😉 Thanks for stopping by! 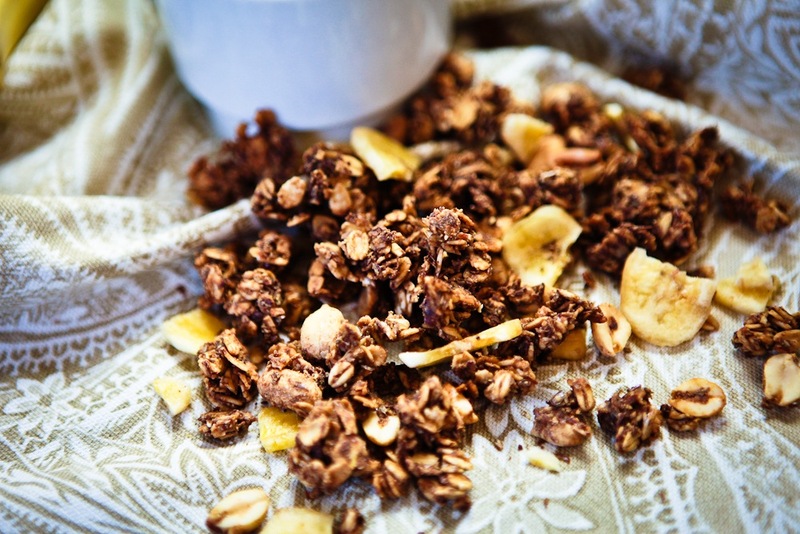 I’ll admit it- I don’t feel like I’m a true vegan blogger yet because I have never made my own granola. I’m a homemade granola virgin. It’s so funny that you say that because there are certain things I haven’t attempted yet (almond milk, for example) that make me feel like I haven’t reached true vegan blogger status too. Glad to know that I’m not the only one! 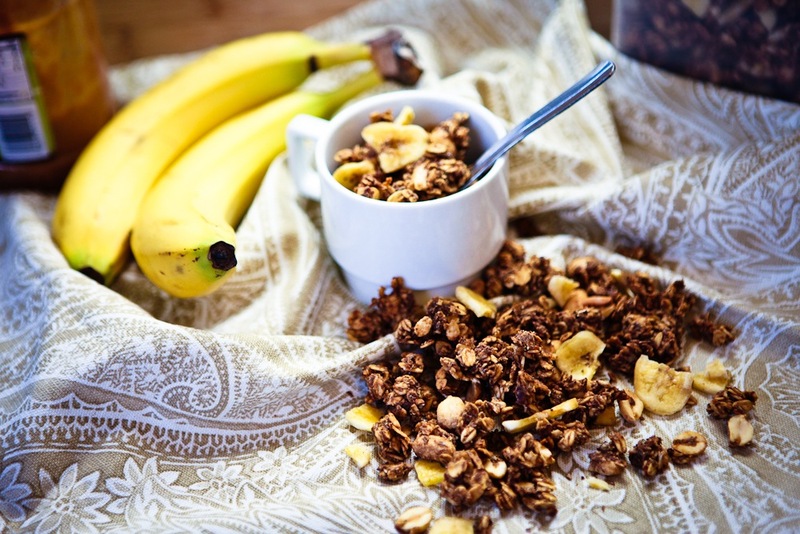 I’ve never made banana granola, but I think you just inspired me to try it soon!